The wait is finally over! In response to overwhelming requests for a classic-style K'NEX Coaster, K'NEX is celebrating its 20th Anniversary and its fans in a big way with the Son of Serpent Coaster! This absolutely huge model is built entirely from over 5,500 classic-K'NEX pieces including rods, connectors, and 53-feet of original tube-style track. Measuring 8-feet x 5-feet x 6-feet and including three K'NEX motors and speakers for your MP3 player, this enormous coaster sends five sleek cars filled with 14 patented K'NEX men figures hurtling down the track, around tight curves, and through gravity-defying loops. 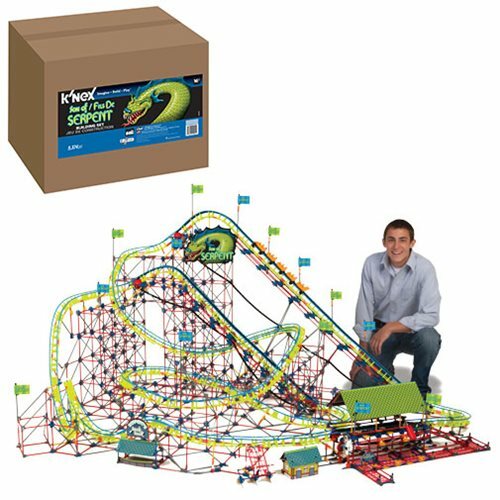 Intended for serious builders ages 16 and up, the Son of Serpent Coaster is an unforgettable way to celebrate your passion for roller coasters and classic K'NEX building sets. Power adapter included for US power sources only.